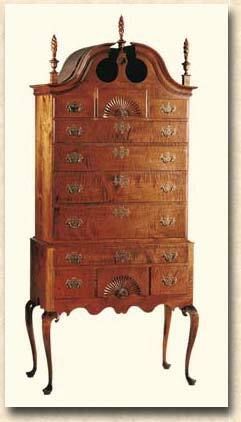 This Highboy, a reproduction of a piece made in Connecticut during the fourth quarter of the eighteenth century, is a classic example of the high level of refinement attained by the early American Master Cabinetmaker. The upper and lower sections both have unique, bold fan carvings. The elegant Queen Anne cabriole legs end in pad feet. The overall proportion of the piece is exceptional and rivals more elaborate pieces made in large metropolitan areas.